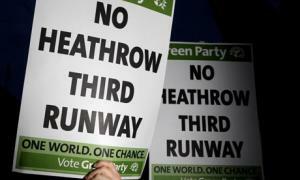 third runway | Plane Stupid - bringing the aviation industry back down to earth! 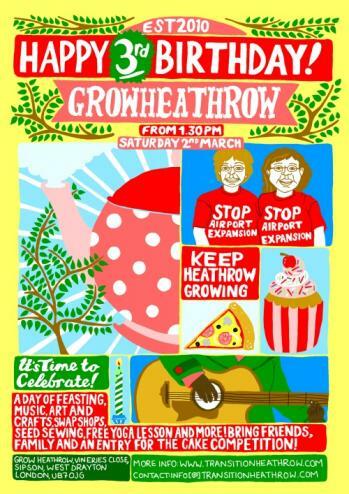 With the arrival of March, Grow Heathrow will turn 3 years old – it’s time to celebrate! Come along for a day of feasting, music, cake competitions, swap shops, arts and crafts, seed sewing, free yoga lesson and celebrations. Bring your friends, family and an entry for the cake competition on Saturday 2nd March, from 1.30 sharp. Like the steady roar of planes coming in to land over West London, the aviation industry keeps droning on about expanding London’s airports. Last week’s reshuffle shows Cameron and Osborne are listening to them too. Cameron and Osborne have established an inquiry to look into “the scale and timing of any requirement for additional capacity to maintain the UK’s position as Europe’s most important aviation hub”. Lest this loaded question prove anything other than a licence to lay tarmac, they asked the former head of the Confederation of British Industry, Howard Davies, to oversee it. Davies was once a special adviser to the climate change denier Lord Lawson. He had to leave the LSE after he was busted for nodding through some chunky donations from Gaddafi’s son. Davies won’t decide to build a third runway until 2015, which means all three parties get to run on a “no third runway unless the commission tells us to build it” platform at the next election. 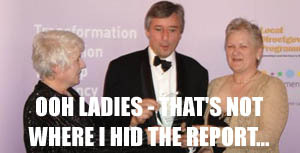 Residents needn’t worry though, because Boris Johnson is on the case. He’s set up a rival inquiry, proving that the invisible hand of the free market will ensure competition. The Mayor’s inquiry will report in 2013 and, like the government’s commission, will conclude that we need lots of more runway space, because that’s what it is being asked to do. Given that no one is going to build a runway in the Thames Estuary – his preferred solution – Boris gets to oppose the third runway while making it ever more likely that Sipson and Harmondsworth will be buried under tarmac. None of this means that the third runway will be built, of course. The strongest argument against it isn’t climate change, it’s that the damned thing has no purpose. There is bags of spare capacity at Heathrow, Gatwick and Stansted airports, which is why Virgin Atlantic was able to offer new routes between London and Manchester days after losing its West Coast train franchise. Using all that spare capacity would be stupid, of course, because flying causes climate change, makes loads of noise and pollutes the air we breathe. But let’s not forget it’s there. Will the last one to leave BAA please turn out the lights? Just over five weeks after joining, BAA's troubleshooter - remit: "to put passengers’ interests first" - has left the company. It's almost getting too easy to mock the struggling airport operator at the moment. They're already under investigation for being so broke that the Competition Commission is concerned that their finances will impact upon passengers and airlines. Since June, Tony Douglas has stepping down as chief executive of Heathrow, Mike Clasper stepped down as chief executive along with Marcus Agius, the chairman, Margaret Ewing, finance director, and Tony Ward, who was in charge of security. Rising noise levels are causing massive discomfort to people living under Heathrow's flightpaths, according to a leaked report which Aviation Minister Jim Fitzpatrick has been sitting on. The report, Attitudes to Noise from Aviation Sources in England (ANASE) was ordered six years ago but kept under wraps since the DfT saw a draft in July. In a damming blow for proponents of the third runway, it has challenged the current measure of noise-related discomfort (57decibels), arguing that "significant annoyance" occurs at 50db levels. BAA's been having a bad run of it lately, what with their Chairman getting sued for corruption, lying to their staff over Stansted expansion, and getting accused of conspiring with the Government over nitrous oxide levels. So when we heard they needed 15,000 volunteers to test Terminal 5, we jumped at the chance to help out. But one hundred Plane Stupid volunteers isn't going to make that much of a difference. To help BAA hit their 15,000 target, we needed to think bigger. And then it hit us: there's probably a few thousand people from the Camp for Climate Action who would love to pay BAA back for the hospitality they showed us during the week. Want to join us? Click here to register. 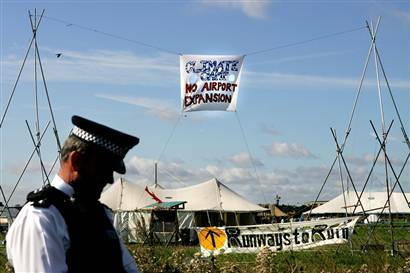 Anyone visiting the Camp for Climate Action last month might be forgiven for calling the policing a little 'over the top'. Called to account by the Green Party's Jenny Jones, Sir Ian Blair, head honcho of the Metropolitan Police, wrote a letter which manages to avoid answering any of the difficult questions about police brutality, unlawful detention, or just why 'Operation Hargood' cost £7 million.